When I found out that the theme for this month’s Veggie/Fruit a Month was blueberries, nothing immediately came to mind. Mike decided we needed oatmeal cookies. He called his mom to get her oatmeal chocolate chip cookie recipe. Turns out, her recipe is adapted from a cookie and candy cookbook she got from her grandmother, which was put out by the gas company. (!) 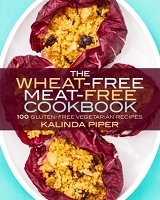 We fiddled some more, making the recipe gluten-free and substituting in the blueberries. I’m quite happy with the results. Preheat the oven to 350 degrees Fahrenheit. Lightly grease two baking sheets. Mix the flours, xanthan gum, baking soda, and salt in a small bowl. Pour the boiling water over the dried blueberries. Let sit for 5 minutes, then drain. Mix the brown sugar and dry milk together in a large bowl. Cream the butter into the sugar mixture, then stir in the egg and vanilla extract. Stir the flour mixture into the sugar mixture. Once the flour is incorporated, stir in the rolled oats. Once the oats are incorporated, gently fold in the blueberries. Drop the batter by the spoonful onto the baking sheets. 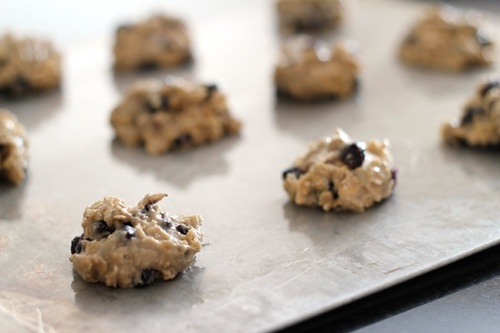 Bake, one sheet at a time, for 10-12 minutes, until cookies are lightly browned around the edges. Remove and allow to cool. I would not recommend trying to substitute fresh blueberries for the dried ones. The batter is pretty thick and fresh berries would get smashed in the mixing. Veggie/Fruit a Month is a monthly event started by Priya of Mharo Rajasthan’s Recipes. This month it’s being hosted at Tamalapaku. The cookies also being shared in the Hearth and Soul Hop, Slightly Indulgent Tuesday, Allergy Free Wednesdays, Full Plate Thursdays, and Allergy Friendly Friday. wow those look so delicious! i love the blueberries in them! mmm! I thought it was a nice change of pace. These look amazing Kalinda! 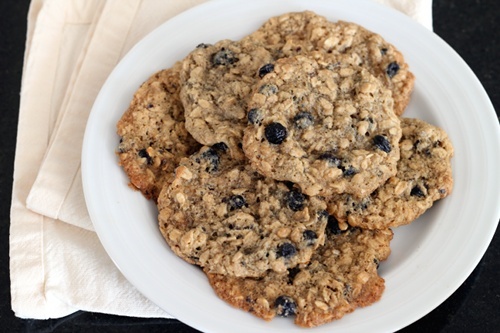 I just made oatmeal cookies the other day with chocolate chips instead of raisins but Ive never thought to add blueberries. Brilliant. YUM! Oatmeal raisin cookies make me sad. They could just as easily be oatmeal chocolate chip, which are clearly superior. Indeed, blueberry muffins seem to be the gold standard of muffins, it seems odd that blueberry cookies aren’t more common. Yes, they were certainly very chewy. I think that’s the best part of oatmeal cookies. 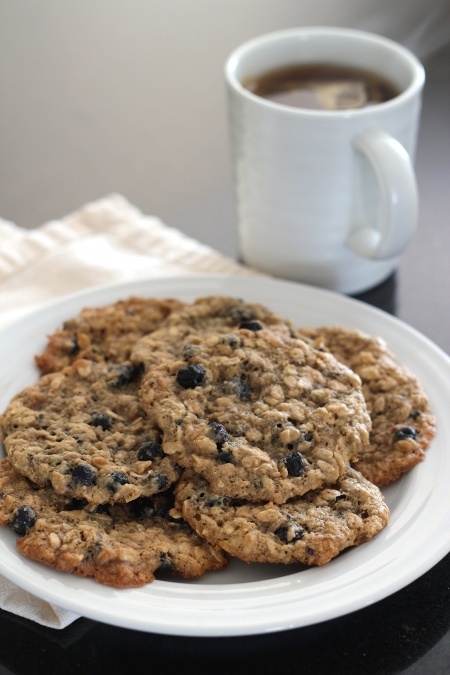 What wonderful cookies – I just love blueberries so they are perfect for me! Love the wholesome ingredients too! I have been enjoying blueberry season. these look super good. is there something I can substitute for the dry milk tho? I will sub xylitol for sugar as well. Well, the dry milk is a substitute my mother-in-law uses to reduce the sugar in recipes. You could try taking it out and adding another 1/3 cup of xylitol. I cannot have dry milk, but these look like such a great treat. Could I use almond milk (the beverage ) ? Also m what are dried blueberries? Do I leave fresh ones on the counter for a few days or are they like craisins? Thank you! These will be great with a cup of hot tea!! I would not use almond milk, since that would be substituting a wet ingredient for a dry ingredient. Unfortunately, it’s really hard to guess what other flours would be good as a substitute. Maybe a nut flour since those are also fairly high in protein? 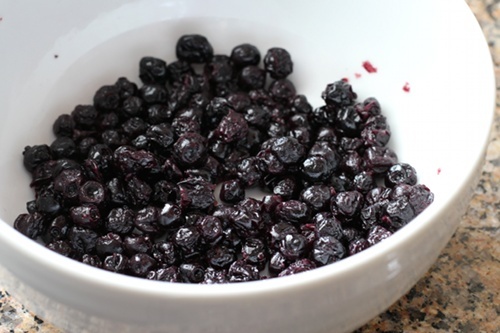 And yes, dried blueberries are basically craisins made with blueberries instead of cranberries. Look for them with the other dried fruit.